We're not sure what has motivated Whole Foods to blatantly give a cold shoulder to Park Slope residents requesting that it consider a transportation plan and a green roof for its planned Gowanus store. Yet, the food retailer--which prides itself on being environmentally friendly--continues rejecting requests for improvements at the store, which would be built on a toxic site at Third Avenue and Third Street about which there are serious lingering safety questions. 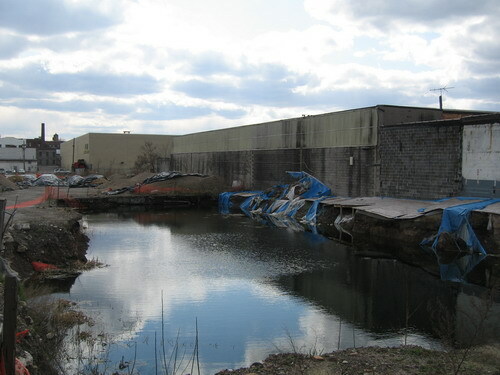 The 64,000 square foot store is tentatively slated to open in Summer 2008, which could be a very ambitious schedule given the complexity of construction on a site adjacent to the Gowanus Canal with a variety of groundwater and toxic issues including carcinogenic benzene leaching into the site from an unidentified source. Council Members David Yassky and Bill DeBlasio are said to be supportive of neighborhood efforts to sway Whole Foods to do more transportation planning plan and to create a green roof. Because Whole Foods is building most of the store below street level, it requires no city approval to move ahead with construction. In mid-December, I moved to Court Street in Carroll Gardens from Logan Circle, in Washington, where I had lived for 12 years. In November 2000, Whole Foods (then Fresh Fields) opened what was then the largest East Coast store in my neighborhood, on P St. between 14th and 15th Streets. The 65,000-sq-ft. store was an explosive catalyst for much-needed development in an area that hadn't seen significant change since it was left desolate and retail-barren after the 1968 riots. Our neighborhood fought for the store, mobilizing a pro bono team of PR, design and real-estate experts to sell the location to the company (and dissuade it from putting it at another location). The store they built was a true gem, and, if anything, has lately been proven to be too small. But the lesson we learned was that you can only push the company so far with certain design demands. And one way you can't push them is with parking: it is imperative that they reach a certain number of spaces to make the store, at least in their eyes, viable. As it turns out, they accurately predicted the number of spaces needed for the Logan Circle store in D.C., and have only very recently had to begin enforcing a two-hour limit on parking. The parking is an equal measure of underground and roof, for a total of about 400 cars. So a warning: they are more than willing to pick up their toys and go elsewhere if the vital goal of parking is not realized. A "green roof" would certainly jeopardize the goal. Indeed, if my past experience is any guide, the idea has got to be anathema to the company. Is it really worth it? If you've experienced the "tipping point" role played by the Whole Foods on P St. in D.C., I've got to say no way. The store is more than just another retail presence, and I think it will have a dramatic effect on many people's daily lives in the surrounding neighborhoods. When it comes to big development, bringing things to fruition is a series of compromises. If anyone is interested in more details about my neighborhood's experience with the company eight years ago, I'd be happy to share them. I'm not familiar with the Logan Circle neighborhood, but a Wikipedia article on the nabe does indeed credit the opening of WFC as the catalyst for gentrification and notes that "housing prices have soared" as a result. So for this we should beg WFC to open in Gowanus? I for one could care less if they decided to choose another location. Certainly not looking forward to the influx of SUVs and other speeding idiots driving in spewing their exhaust and death all over the neighborhood so that they can buy some overpriced groceries. I have gotten by just fine getting my groceries elsewhere up until now. If WF wants to go elsewhere, sounds good to me. The neighborhood's just fine, it's not particularly "desolate and retail-barren" with Court St, Smith St, 5th and 7th Avenues all a quick walk or bus (or bike) ride away. And the people who choose to live there now do so for the quieter, industrial charm. Meanwhile the people who have lived there longer are threatened by the rising rents and gentrification you're saying Whole Foods will bring. This neighborhood is not East New York, BK or Morrisania, Bronx - it's sandwiched between two of the most gentrified neighborhoods in the borough. There are plenty of good yuppy food options - for example, I shop at the Whole Foods and Trader Joe's on 14th St in Manhattan after work sometimes and carry it home on the train. No big deal. I appreciate your reasonable insight on the issue but I don't think too many people in the neighborhood, whether upper-income artistic newcomers or low-income longer residents, are really dying for Whole Foods or the "development" that it would bring. Comparing your neighborhood to this may be a case of apples & oranges. I'm not familiar with Logan Circle, either, but I'm pretty certain that this part of Brooklyn doesn't need an "explosive catalyst for much-needed development." We seem to have all the development we can handle at the moment. What we do need is a catalyst for better regional planning so that we can grow in a sustainable fashion. We may get some of that from the Mayor, when he reveals the PlaNYC 2030 plan on Earth Day. It's a safe bet that building huge parking lots in urban areas WON'T be one of the things he'll be calling for. But it is likely that the Mayor will be calling for lots of green and solar roofs, especially with the news this week that a whopping 79% of New York City's greenhouse gas emissions emanate from buildings. It can't be long before NYC starts to mandate that large new commercial developments incorporate green or solar roofs, so Whole Foods, which claims to pride itself on its sustainable practices, might as well get out in front on this. I also must take issue with David's claim that Whole Foods "accurately predicted the number of spaces needed for the Logan Circle store." Parking lots are a self-fulfilling prophecy. If you build a huge lot, you'll encourage people to drive. If you build a smaller lot and offer and promote alternative means of transportation, that's what you'll get. The vast majority of NYC residents walk to the grocery store. Even at the Fairway in Red Hook, to which nearly every customer drives, the 300-car parking lot is more than adequate. Nothing in David's account of the Logan Circle example lends any credence to the idea that Whole Foods would abandon this site if they can't build their huge 420-car lot. If there are examples of Whole Foods abandoning projects over reasonable community requests, let's have them. And the green roof that Whole Foods is installing in Madison, Wisconsin doesn't appear to have been "anathema" to that project. Nor have the several solar-panel installations at Whole Foods stores around the country been a stumbling block. Whole Foods might qualify as "more than just another retail presence" if they were interested in living up to the ideals they outline in their "Declaration of Interdependence." But as The New York Times reported a few weeks ago, the bloom is increasingly falling off the Whole Foods rose. The community is not asking for anything remotely unreasonable. In fact, the only party seemingly unwilling to "compromise" is Whole Foods itself. They might eventually make for a terrific addition to the neighborhood, but they've got a long way to go to be "a true gem."